Redaction By: Master Drake (Craig Jones), December 2016. 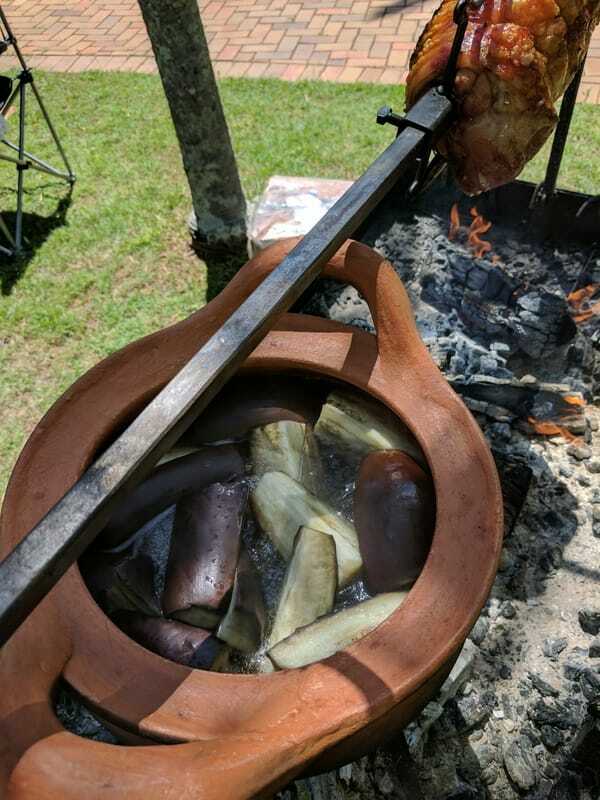 Cook [whole] eggplants in water until done. Take them out of the hot water and put them in cold water. Prepare a small pot. Take a small amount of chopped onion and fresh herbs and fry them in the pot with olive oil. 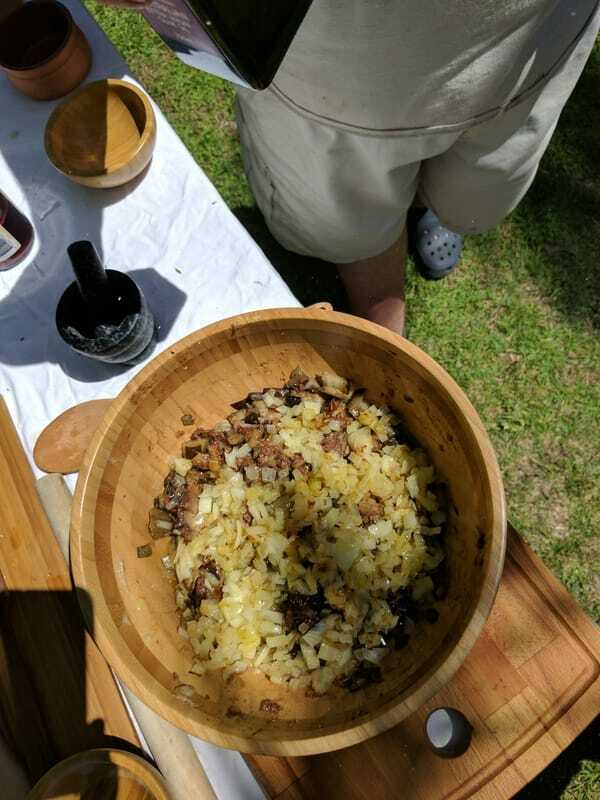 Mix vinegar, murri (liquid fermented sauce), binn (fermented sauce), caraway seeds, and cassia, and add them to the fried onion. 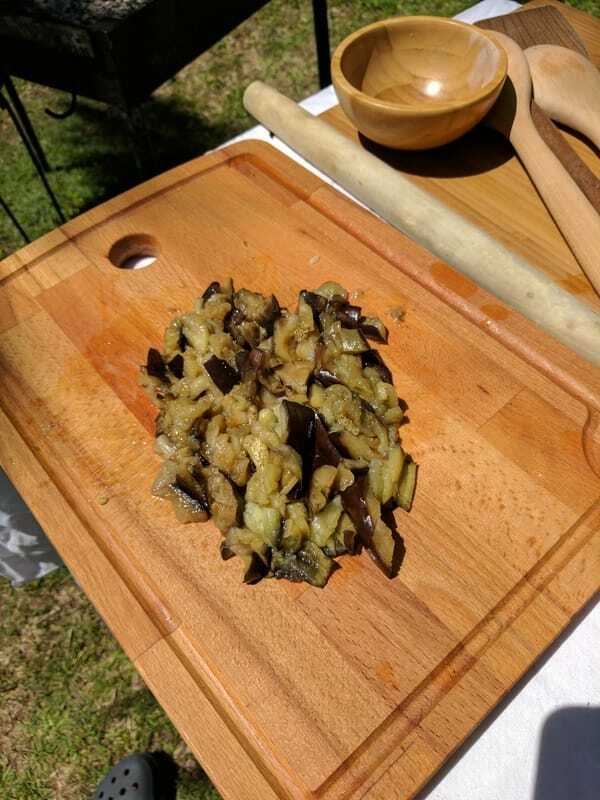 Cut off the calyxes of the eggplants, [put them in a plate], and pour the vinegar mixture all over them. Drizzle the dish with a small amount of olive oil and eat it, God willing. ​Another dressed eggplant (Badhinjan Mahshi), also by him: Boil the eggplants and chop them into small pieces. Pound walnuts, put them [along with the eggplant] in a bowl, and add salt. Knead mixture with some vinegar, [make it into a patty], and stick it to a big bowl (tayfuriyya). 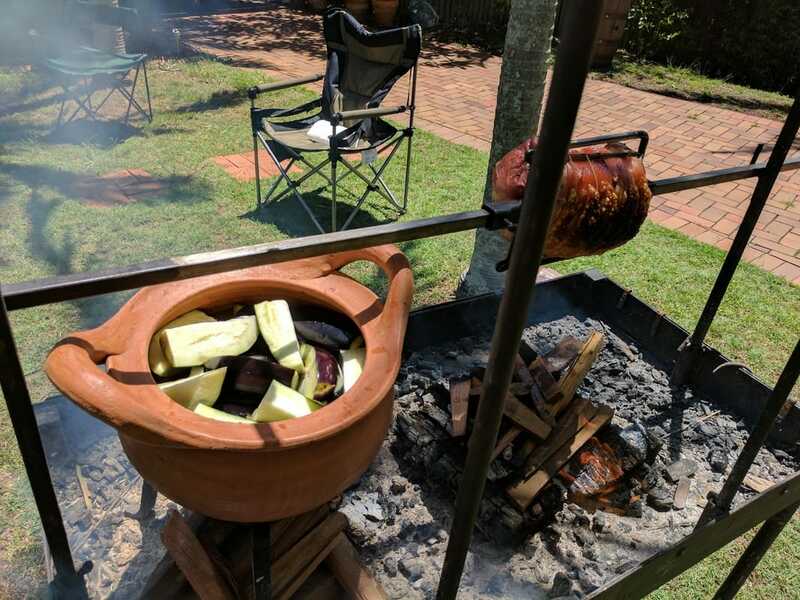 Smoke the eggplant by pouring some olive oil on a burning fire. Scrape the eggplant patty (qurs) and flip it to the other side to allow it to smoke. Stir the smoked eggplant with some vinegar and caraway seeds. You may add some onion if you like. Drizzle some olive oil on the dish and serve it, God willing. Another recipe for dressed eggplant (Badhinjan Mahshi) by him, too: Boil eggplant and chop it into fine pieces. Take a platter (j§m), and pour on it a little vinegar, white sugar, ground almonds, saffron, caraway seeds, cassia, [and mix]. 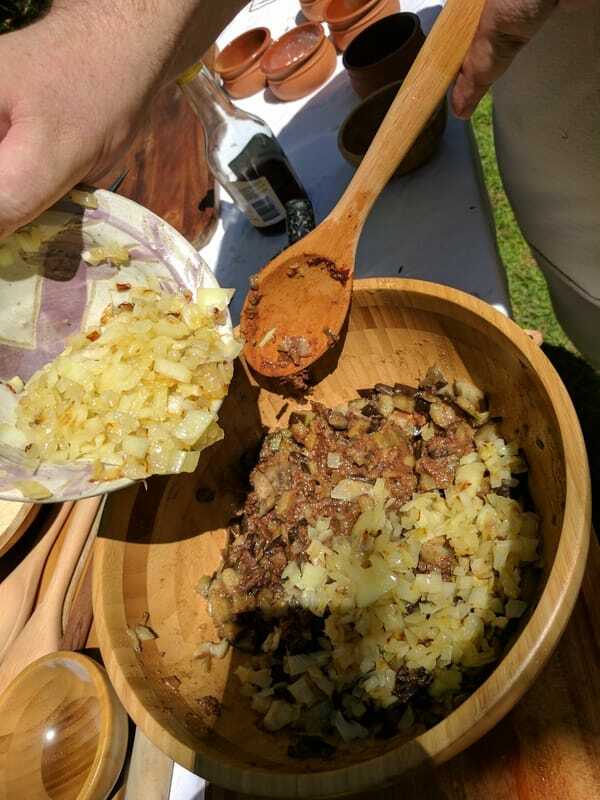 Spread the [chopped] eggplant and fried onion all over the sauce. Drizzle some olive oil on the dish and serve it, God willing. 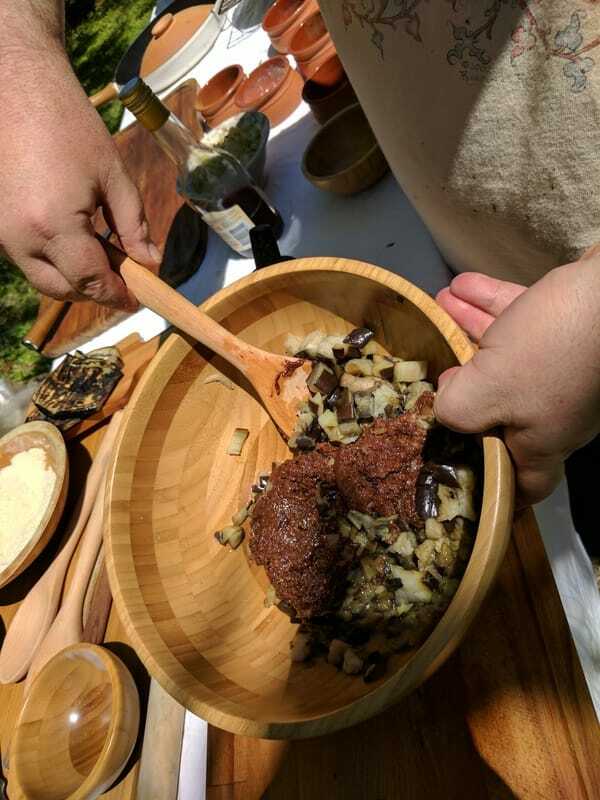 I used the third recipe for dressed eggplant but included the first two recipes for completeness and to more fully understand the method we used. This recipes is in the "Chapter 45 - Making Cold Dishes (Bawarid) of Vegetables and the Best of Roots" section. Serves 8-12 as a side dish. Cut eggplant into 4 pieces per eggplant. Boil eggplant for 10 or so minutes. Eggplant should be soft. Drain off water and finely dice eggplant. Because of how soft they are, they should virtually turn into a paste. In a frypan, add some oil and gently fry diced onions. Mix the spices and flaky salt and vinegar together, add sugar and almond meal to thicken sauce. 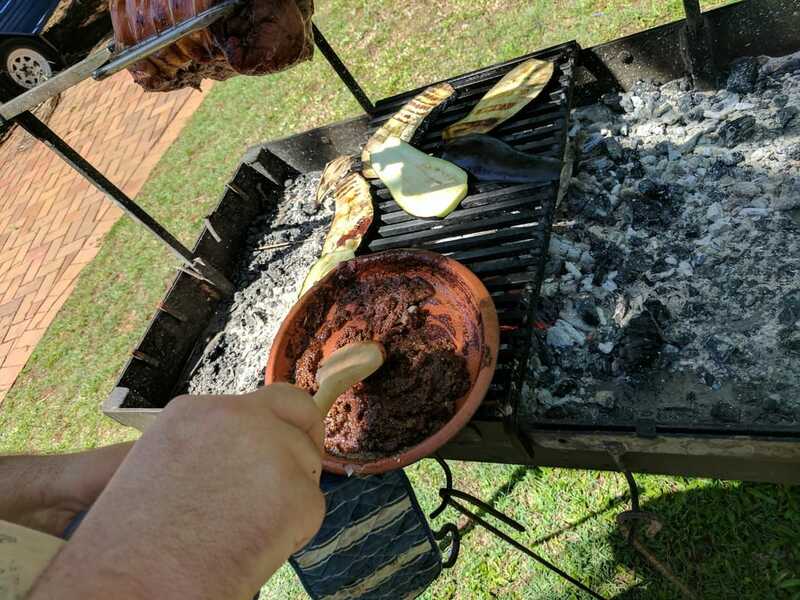 Mix the sauce through the eggplant. Sprinkle onions over the top , florish with a swirl of Olive Oil and Serve. 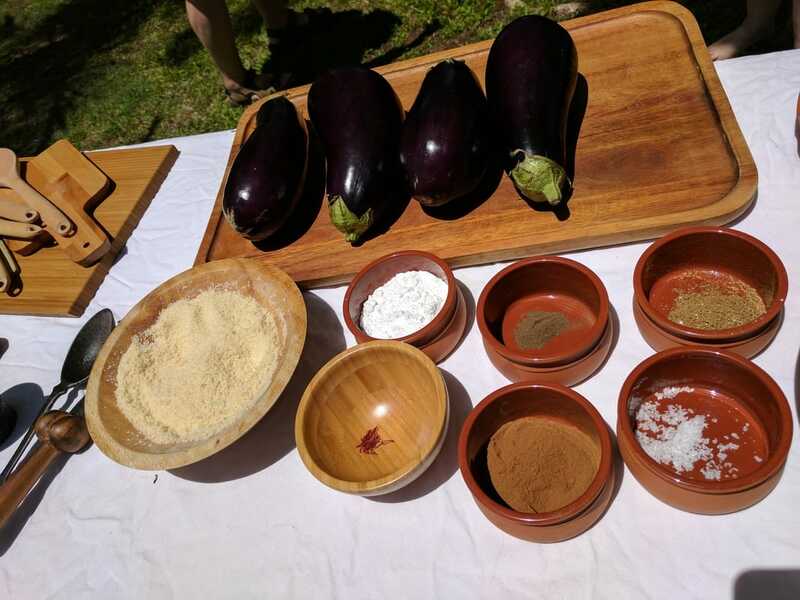 Spices for Eggplant. Almond Meal on left. Smaller bowls clockwise from Top Left: Powdered Sugar, Pepper, Caraway, Flaky Sea Salt, Cassia, Saffron. Eggplant is boiled and ready to be strained. 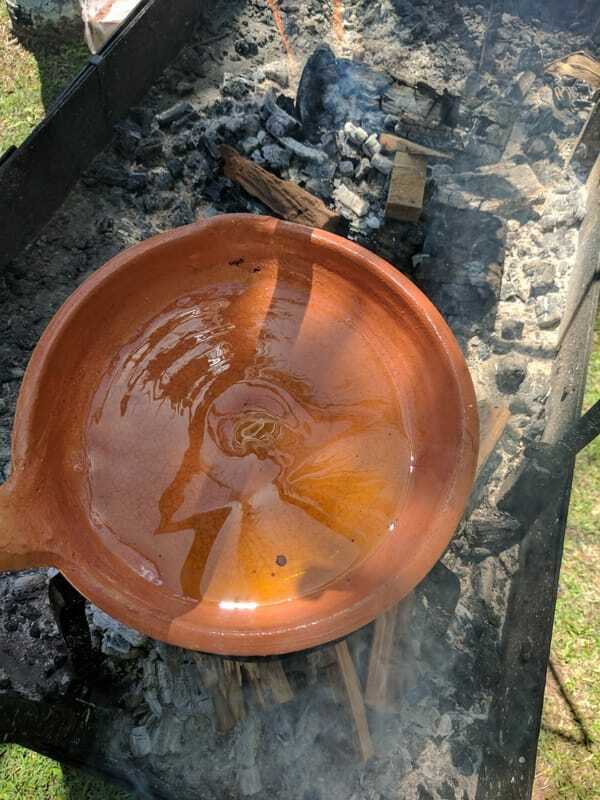 Olive oil heating up in a clay skillet. 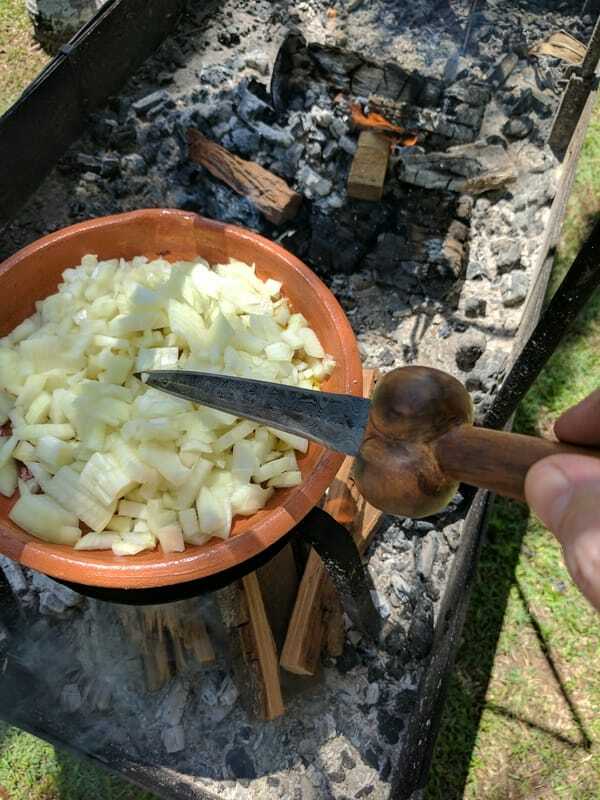 Onions being gently fried in oil. Eggplant strained and diced finely. Sauce being folded through the eggplant. Onions being added on the top. Finished dish. It's better hot and is a lovely sweet and sour combo, with the meatiness of the eggplants coming through. This would be a great meat replacement dish for vegetarian/vegans.